So is there an expectation that actors of a certain distinction will reach the point where tackling Lear seems absolutely inevitable? Michael Pennington who takes on the role at the Theatre Royal Brighton until Saturday (May 7th) answers with a laugh… and a reference to Ralph Richardson. “I always think of Ralph Richardson who used to say that you are going along and everything is fie and the sun is shining and then suddenly you get your foot caught in Lear! Well, it is now time with that particular bramble called Lear. 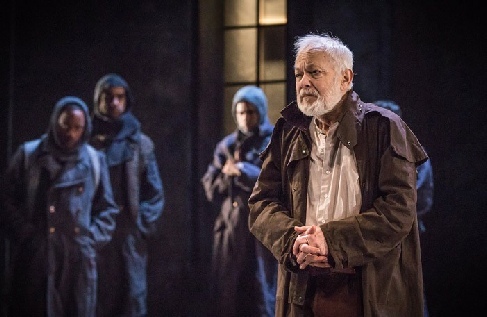 But then a few years ago, he was doing the Ronald Harwood play Collaboration in Chichester’s Minerva Theatre, and there was something about his character that set him thinking about Lear more seriously. As Michael says, with Lear, you have to accept that there is only a fairly narrow window in an actor’s career - that moment when you are roughly the right age but can still match memory with the energy the role requires. This is in fact Michael’s second Lear. His first was two years ago in New York. “It was a completely different production, and everything about it was different to the extent that I am the only point of contact between the two. I tried to import the American production ut it was too expensive and too difficult, so I remembered my old days as actor-manager and decided to try to set up a new production over here. We have come up with a really interesting co-production between a subsidised theatre in Northampton and the corporate sector. It has been fascinating to do. As for Lear himself: “I think he is terrific. His default ode is to fight back. He doesn’t do self-pity. He fights and fights and fights. His huge mistake is at the beginning of the play, but really the key thing is what we now call dementia. There is no question that most of us have experienced someone who comes and goes mentally as Lear does. Sometimes he is brilliantly clear, and sometimes he away with the fairies.